We’re launching a campaign today for children to design a poster to that depicts their rights. such protection and care as is necessary for their well-being. Having the child’s best interests as a primary consideration. maintaining on a regular basis a personal relationship and direct contact with both his or her parents, unless that is contrary to his or her interests. The deadline for submitting posters is 31 October of this year and winners will be announced on 20 November, the International Day of the Rights of the Child. I was chatting with my friend Aris last night on Facebook – he’s a former colleague from DG Research and now working in Barcelona (lucky beggar) doing communications at the Fusion4energy organisation, which is the European agency for the ITER project. ITER is about finding a new way to produce energy, based on the reaction that takes place in the sun as hydrogen and helium atoms collide, fuse and release energy. In ITER, this process takes place within a doughnut-shaped (toroid) chamber, called a tokamak. 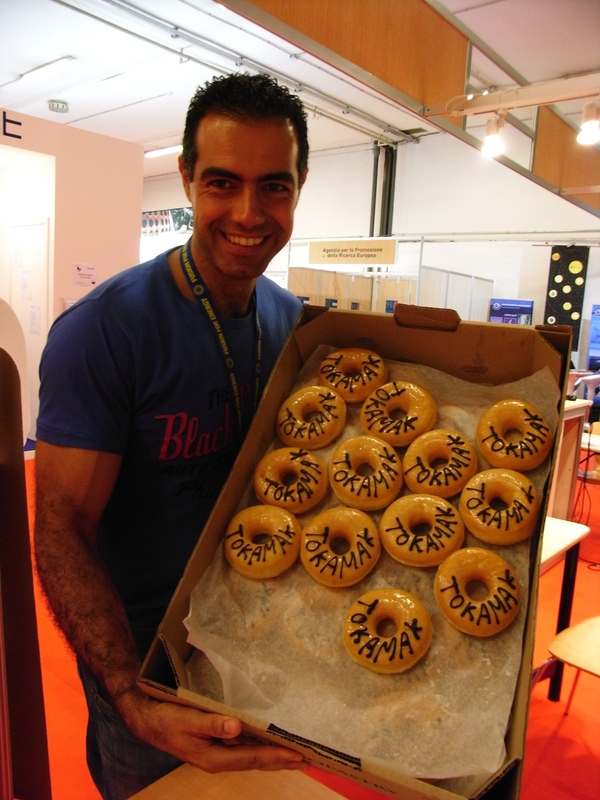 So they gave out doughnuts with “Tokamak” written on them! Here’s a pic – very inventive I thought. Even got a mention in Science! Aris shows us what a torus looks like. So that was a fun way of making a point, and here’s another one from ESOF. EUFIC, the European Food Information Council, launched an internet tool to help us balance our food intake and our activity. I guess we all know that at the end of the day, the best way to maintain a healthy lifestyle is to eat less and exercise more, but sometimes it’s difficult to know how to quantify that. This website helps – you can get it to tell you how much walking you need to do to walk off a bag of Tooty Frooties ( a terrifying 38 minutes – that’s the sweets relegated to the drawer for a while!). A really great initiative, I thought. The weekend saw the move into the new house. Well, I already live there, but I had to move rooms and the new guy arrived and Rob and Amanda left, so it was all go. My brother arrived in the middle of it alland I met him and his friends in the evening. So a nice, but knackering day and I slept like a baby. Sunday was very low-key, which was more than made up for by Monday! We have a really busy week, with several big stories coming out, including the drive to reduce the price of text roaming that will be announced today. We’ve been answering questions, setting up interviews and so on. It’s good to have announcements like this, which prove that we’re not all about arguing over institutional issues – mostly what we’re about is getting on with using our combined strength as a single market to benefit consumers. Another story that cropped (hoho) up today was about tobacco and the agricultural subsidies that go to it while at the same time we are spending money on combatting smoking. It’s an irony that is not lost on the Commission, which is why we have pushed through proposals to stop the subsidies from 2010. Of course they can’t just be stopped one day, as it’s about livelihoods, and they need time to adjust their farming to a different crop. But from 2010 there will be no EU budget support for tobacco growing, in spite of attempts by some in the European Parliament to extend that deadline. I had a really interesting meeting yesterday with a woman who does communication for a variety of EU research projects. It was nice to have that link back to my old subject, which still tugs at my heartstrings, and also to hear about how the projects are working with each other to address their communication needs. She works in the field of health and nutrition, so really relevant to today’s world and something that can really resonate. I was speaking to a health journalist a few days ago and she said that when a press release comes from the European Commission about scientific results, they are more likely to take it seriously, as it demonstrates an objectivity (ie not funded by food or pharma companies). One of the funny sides of this job is being a “diplomat” in your own country. No, don’t worry, I don’t get diplomatic immunity or anything like that, but I am part of a community here in London, with invites to the embassies, working with them on initiatives, taking part in cultural events. It’s a really nice side to the job, and makes it feel less like I’ve “come back” to London, and more like I’m in a different place to last time.